If you use ordinary linear regression with a response of count data, if may work out fine (Part 1), or you may run into some problems (Part 2). Given that a count response could be problematic, why not use a regression procedure developed to handle a response of counts? A Poisson regression analysis is designed to analyze a regression model with a count response. Notice that with Poisson regression, the regression equation never produces a negative count response, as it can for ordinary linear regression. That's because even if the equation contains negative coefficients that produce a negative value of Y' for some values of the predictors, the exponentiated value of that negative value will always be positive. The smallest response estimate you can possibly get is essentially 0. That's a definite advantage of using Poisson regression with a count response—you don't have to grapple with those weird "antimatter" response estimates. As with any regression analysis, Poisson regression has model assumptions that need to be evaluated, by examining the residual plots. Here, the residual plots seem to be OK. The Residuals Versus Log of Fits plot shows a slight increasing pattern—but nothing as troublesome as the classic megaphone pattern we saw when we evaluated these data using ordinary linear regression in Part 2. For the goodness-of-fit tests, smaller p-values (such as values less than 0.05) indicate that the model does not adequately fit the data. The p-values here are relatively large (> 0.9), so there's no statistically significant evidence of lack-of-fit. That's a good thing! 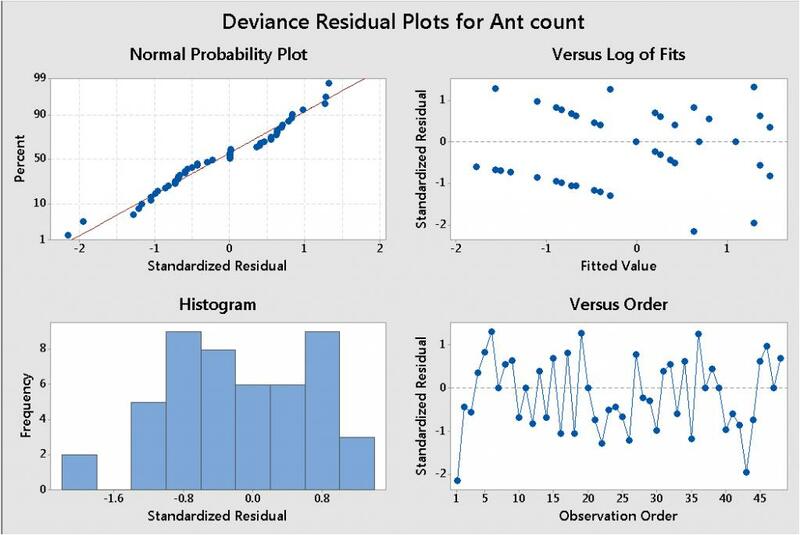 Using Poisson regression to evaluate the data set of small ant counts (shown by the red values in the dot plot below) worked out well. We avoided all of the messy problems that arose when we tried to evaluate these data using ordinary linear regression in Part 2. Is Poisson Regression Always a Better Choice for a Count Response? So Poisson regression can often provide more suitable results for a count response than ordinary linear regression. But is it always a better choice? 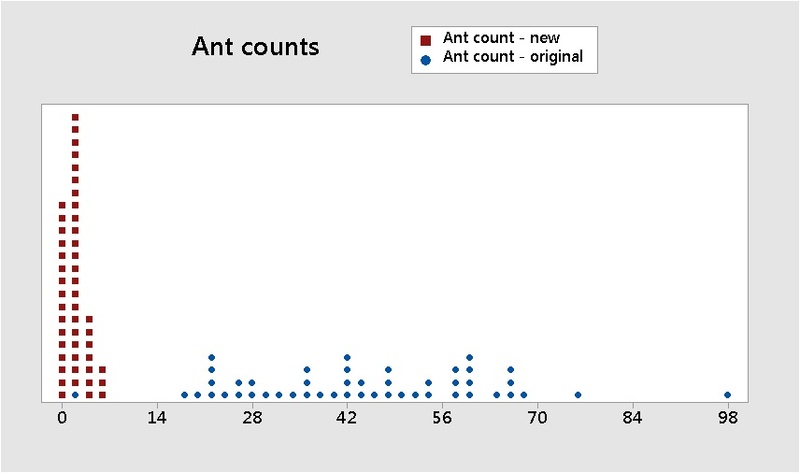 Let's go back, full-circle, to the original ant count data set from am.stat org, shown by the blue data values in the dotplot below). 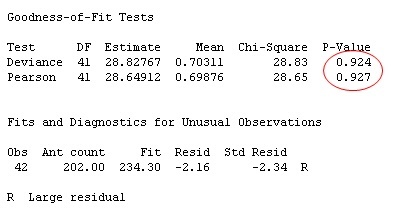 The p-value for the model fit is very small (< 0.05), indicating poor model fit. 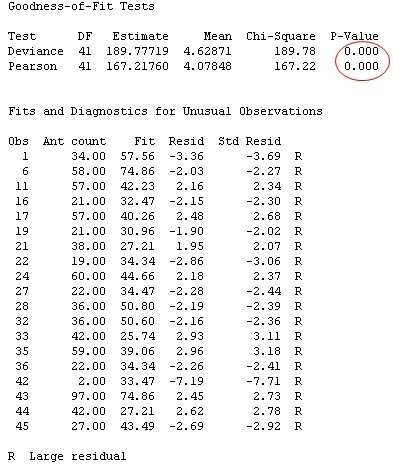 In fact, 19 of the 48 values in the data set are flagged as "unusual observations"! That's almost 40% of the data—much more than the 5% that you could expect to occur by random chance. One thing that can throw the proverbial wrench into a Poisson model is overdispersion. 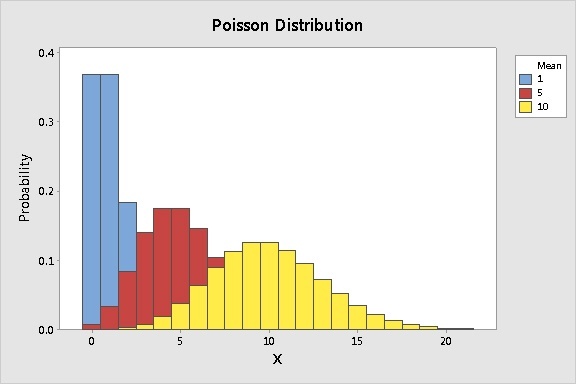 A Poisson distribution is technically defined as a distribution with equal mean and variance. If the variance of the data is much greater than its mean, it can cause problems. Just for illustrative purposes (never do something like this with your data! ), consider what happens if you add a value of 200 to each count in this data set, to make the mean and variance closer. The goodness-of-fit p-values are high and indicate no evidence of lack of fit. In fact, only one data value is now flagged as an unusual observation. The Poisson model is much happier when the mean and variance are closer together (they don't have to be exactly equal, though). Moral of the story? For the original data set of count responses, the model fit was actually better with the ordinary linear regression than it was for Poisson regression, due to overdispersion. Both analyses perform equally well with a ham and pickle, a peanut butter, or a Vegemite sandwich.